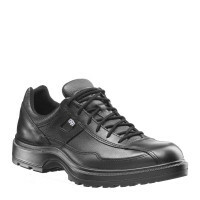 Product information "HAIX Airpower C7"
The HAIX Airpower C7 is a waterproof and breathable high quality leather shoe which is suitable for leisure purposes and for use by police officers on duty. It offers a particularly high degree of comfort by reducing pressure on the feet, cushioning your steps and correcting the foot position. No pressure points will arise, even after long periods spent standing or walking. The HAIX Airpower C7 provides a perfect fit, thus stabilising and supporting the ankle area. Its classic black design makes it appropriate for office wear. Police officers and their footwear are required to go out in all weathers. The Airpower C7 by HAIX will never leave you in the lurch. The smooth and supple leather used in its manufacture has been hydrophobised, i.e. treated in a special way to make it waterproof. A GORE-TEX® membrane ensures that no moisture can penetrate the shoe, even in rainy, muddy and snowy conditions. 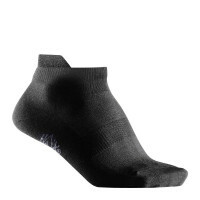 The sole of the Airpower C7 provides insulation against the cold, something which is particularly important in winter. This is a shoe which also performs superbly well in hot conditions. Its highly breathable GORE-TEX membrane will keep your feet dry, while special pigments prevent any overheating caused by the sun’s rays. This means that less warmth is transported to your feet. An inlay acts in conjunction with an additional fleece insole to absorb moisture. The quick-drying properties of these two elements mean that your feet will soon be feeling comfortable again. The Airpower C7 is a light shoe which is designed for hours of easy wearing. The HAIX Arch Support System enables it to adjust to the natural curvature of the metatarsus to support your joints and make sure that you do not go over on your ankle. The narrow shape of the heel area guarantees a secure foothold and optimum toe-to-heel movement whilst the toes and balls of the feet are also afforded plenty of room at the front of the shoe. You will not suffer any foot pain, even if you remain on the go throughout the entire day. A light PU impact-absorbing wedge integrated into the sole cushions your steps as you walk and reduces pressure on the back and spine. A softly padded cuff lining inside the heel part of the shoe prevents any rubbing. All of this makes the Airpower C7 both a good workwear option and an ideal companion for weekend leisure activities. 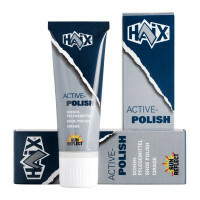 The HAIX Airpower C7 is manufactured in high quality leather, which has been hydrophobised and thus rendered watertight. A three-ply GORE-TEX® membrane makes the shoe weatherproof. This material prevents the penetration of moisture whilst also being highly breathable. Special pigments in the leather reflect the sun’s rays to prevent overheating in warm temperatures. The Airpower C7 features a classic lacing system. An abrasion-resistant and breathable inner lining ensures a particularly high level of climate comfort. A fast-drying fleece insole and an inlay combine to absorb moisture to leave your feet feeling pleasantly dry. The inlay may be removed and washed if required. The footbed reduces the strain on your joints and back by cushioning your steps as you go. A softly padded cuff prevents painful rubbing after long periods of wear. The black sole of the HAIX Airpower C7 is manufactured in thermoplastic polyurethane (TPU). This makes it abrasion and slip resistant as well as providing elasticity. A PU wedge absorbs impact as you walk. The sole also provides outstanding insulation against the cold, something which is particularly important for outdoor deployments. It is also resistant to oil and petrol and leaves no ugly black marks on light-coloured tiles and laminate floors. Regardless of whether you are working as a police officer or looking for a good outdoor leisure option, the Airpower C7 is a waterproof and highly breathable shoe which provides superb climate comfort in any environment. This makes it the perfect shoe for both work and play. Discover this sporty and weatherproof HAIX shoe for yourself now.